“Can we get married on board?” Many couples ask this question. Besides being a wonderful venue for a wedding reception, our Yankee Lady ships are great for a wedding ceremony of up to 100 people. We have three options to choose from: inside deck, 2nd deck or observation deck set ups available; we’d be happy to help you have that wonderful ceremony on board. If you would like just your ceremony on board why not check out our Wedding Ceremony in the Lagoons package, or let our wedding experts customize your event. Next you will be asking, “Can the Captain marry us?” This time the answer is NO. While it wouldn’t be legal if the captain married you on board, we can certainly help you get an official who can. 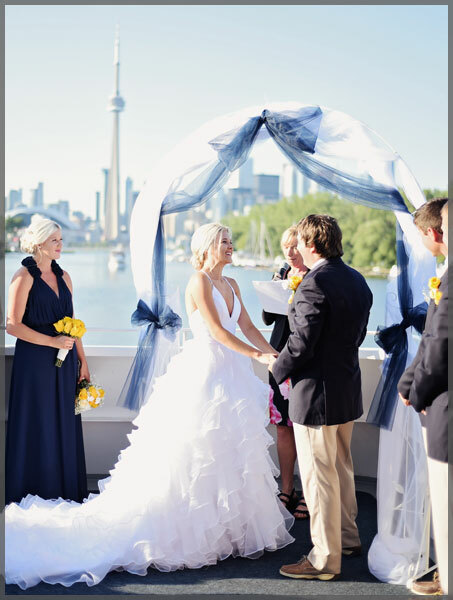 Whether you want to have your reception elsewhere or with us, let Yankee Lady Yacht Charters plan the perfect Toronto Wedding Ceremony for you.